Specifically designed to transport 6 laptops up to: 15.3 x 11 x 1.80 inches and one projector 10.5 x 9.5 x 11. 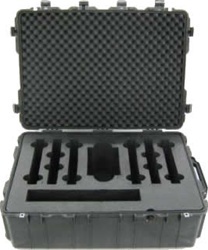 Made up of a Closed Cell Polyethylene insert and combined with the Pelican 1730 case this is ready for the long hall.
. This case is great for Mobile Command Centers, Trade Shows, Mobile classrooms, Training centers, Sales forces, Mobile Gaming centers.